Much of the game we knew as Final Fantasy Versus XIII is no more, now made evident today by director Hajime Tabata who shared new reasoning behind changes long suspected. By far the biggest change is the removal of Stella Nox Fleuret – who was set to be the main heroine opposite of Noctis. The second change Tabata mentioned was in regard to the city of Insomnia and a scene once seen as the opening of Versus XIII wherein Noctis visits a party taking place in the city. That sequence too has been “deleted” from Final Fantasy XV. “Now, if you have been following info on Versus, you may already know this, but there was a sequence of scenes right after the party where the city is attacked by the enemy forces of Niflheim,” said Tabata. “That sequence has been deleted from FFXV. And there is a good reason behind it. “Scenes like those had to be regressed because of a very critical factor. So now, the sequence is: Noct and his retinue leave Insomnia, and then… What was it? Then the Niflheim army attacks the crown city. There’s an extremely important reason behind this decision. In fact, it could be construed a spoiler, so I can’t tell you about it here. While these changes are being made to the game, Tabata did confirm both the black-haired woman from the 2013 E3 trailer the the dragoon lady we saw back in 2011 are still intact and will have important roles within the story. Everything he mentioned has been part of an extensive debate in an effort – according to him – to make the game better. “Quite some time has passed now… After we had switched from Versus to XV, the first decision we made was to make sure that FFXV would have a complete, coherent story in one game. That was an important decision—one made at the company level, too. So I started thinking about how we could get a full, coherent story in a single game. And the crux of that was which elements from Versus we could carry over and which would not fit into the new structure as XV. “So I went through everything in detail, seeing which areas we would have to change. By that time, a fair amount of information about the Versus story had already been released, so we tried to keep as many elements from it as we could. We tried hard in a number of areas. But it would have been very difficult to carry over absolutely everything as it was. We considered what was possible with the new-gen hardware, as well as what elements absolutely must be included in XV but might fall through if not given top priority. It was not easy to nail down what was essential for the story to be contained in one title. Everyone involved was very sensitive in dealing with this, and we patiently debated numerous times, but we still couldn’t come up with a definitive answer. 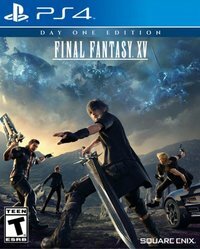 Final Fantasy XV – while based on Versus XIII – has become a different game. Final Fantasy XV Episode Duscae 2.0 patch will release on June 9th, 2015. Because the date was pushed back a bit, Tabata confirmed several items they had hoped to include such as framerate improvements and additional quests have indeed made their way in. A video was shared showing some of the improvements in action as well, including updated combos, co-op abilities and new camping scenes. Finally, the company has posted another video, looking at behind-the-scenes tech footage of areas and scenes from Episode Duscae.